The Clovis culture takes its name from the town in New Mexico, where the striking stone projectile point characteristic of the tradition was first found. It's distinctive characteristics include a central groove, or flute, along both of its faces and finely worked edges. The typical blade measures 10-13 cm in length by 4 cm in width and was produced by a combination of percussion and pressure flaking. The fluting allowed hafting to a wooden spear shaft to make a formidable weapon. (See Art Gumbus' LITHICS-Net for a fully detailed description of a Clovis point.) Similar Clovis points have been found in every region of North America south of the glaciers. The Clovis tool kit also included bifaces that could have been used as tools themselves or further worked into other tool types. Flakes could readily be struck from the biface and used as end scrapers, used for processing hides and other materials (view Tony Baker's detailed discussion of Paleoindian endscrapers), and gravers, spokeshaves and burins that may have been part of a wood or bone working industry. Shaft straighteners, called "wrenches", have also been found. Clovis tools were usually made from high quality stone, such as chert and obsidian, quarried at locations as far as several hundred kilometers from habitation sites ( Kelly and Todd 1988:237 ). Clovis points are found in association with the bones of Ice Age animals in sites in many areas of North America and document both the importance of big game hunting and the effectiveness of early Palaeo weaponry. 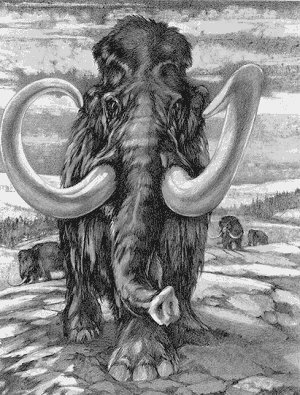 The species exploited included mammoths, who grazed on the tundra grasses and mastodons who browsed on the spruce needles. Giant, long-horned bison provided a secondary food source. Only four or five Clovis points have been found in Manitoba. One beautiful specimen (right) is made of Knife River Flint, which was probably quarried in what is now western North Dakota. The rarity of points and absence of other artifacts or signs of settlement suggests the presence of small groups who made only infrequent visits to the province in the course of their movements. While there is no local evidence to suggest the settlement or social forms of Clovis groups, their dependence on prevailing migrations of mammoth herds must have involved movements overs long distances. Clovis sites elsewhere give us some insight into ritual and belief systems. In southern Ontario ( Ellis and Deller 1991 ) a cache of about 200 burnt chert implements were discovered in a pit which may represent the remains of a cremation burial. Furthermore, at a Clovis burial site in Montana, powdered red ochre (hematite) was found on the remains of two adolescents and the grave goods that were buried with them. The use of red ochre on burials is an ancient one that extends back to European and Asian traditions. The practice persisted amongst many Aboriginal groups until the 19th century.